The aftermath of the Williams cases was a very large number of articles and commentaries which indicated that a major upheaval for Commonwealth Government contracting had occurred. Despite this, there have so far been no repercussions reflected in case law. Nevertheless, there is serious uncertainty facing practitioners and public servants about Commonwealth contracts and grants. This uncertainty stems from the apparent message that some Commonwealth contracts must be backed by legislation. This requirement, in turn, stems from executive power being insufficient. This insufficiency is itself uncertain because four judges in Williams v Commonwealth (2012) 248 CLR 156;  HCA 23 (Williams 1) abandoned the “common assumption” test of the scope of executive power. It is not clear what test replaced the previous linking of executive power to legislative power. This article argues for restoration of the common assumption test. It also demonstrates that the idea of legislative backing for government contracts is not straightforward and that it does not meet the concerns about responsible government expressed in the Williams cases. Administrative tribunals are not usually bound by the rules of evidence. But they may be assisted by those rules, and this possibility is anticipated by the legislation governing the Victorian Civil and Administrative Tribunal. The legislation says that the Tribunal is not bound by the rules of evidence, except to the extent that it “adopts” those rules. This proviso has not yet been studied closely by the Tribunal or the courts, and so some basic questions about it remain to be answered. A few such questions are posed in this article. They relate both to the manner in which the Tribunal adopts the rules of evidence and to the consequences of it doing so. Of these questions, the most important is whether a failure by the Tribunal to correctly apply the rules of evidence, in the event that it adopts the rules, will result in some kind of legal error. To this, the surprising answer seems to be sometimes, but not always. Given the advantages of declaratory relief, one would expect the remedy to be more widely utilised than present experience suggests. This is especially so in the case of public and regulatory litigation, which is often dominated by institutional or sophisticated litigants. 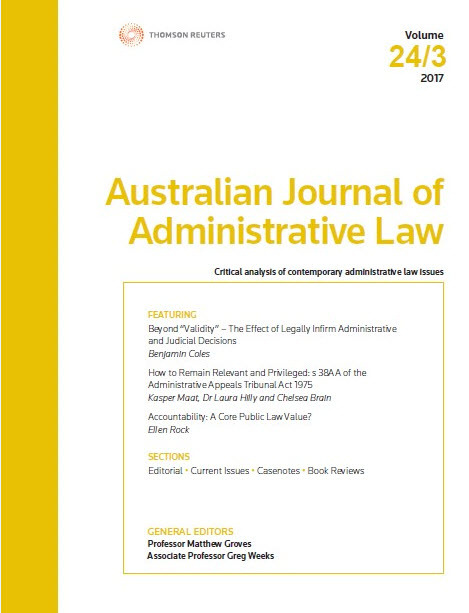 This article attempts to discover why declaratory relief is not the dominant remedy in our system of administrative justice by precisely identifying its limitations. It is submitted that the vagaries of discretion have served to undermine the flexibility of declaratory relief, and that once the framework underpinning that discretion is properly understood, there is little in the way of the remedy becoming more prominent in litigation culture. Through declaratory relief, there is enormous potential to economise litigation through which regulators, administrators, courts, litigants and the general public all stand to benefit. For the PDF version of the table of contents, click here: AJ Admin L Vol 25 No 3 Contents.